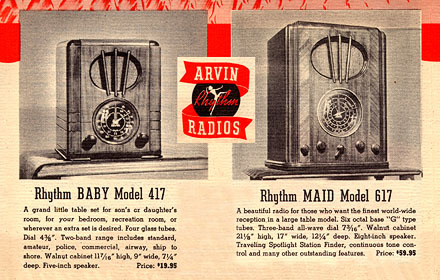 Arvin 417 "Rhythm Baby" / Arvin 617 "Rhythm Maid"
Arvin 417: 6A7 mixer/oscillator, 6F7 IF/detector, 41 audio output, 80 rectifier; Arvin 617: 6K7G RF, 6A8G mixer/oscillator, 6K7G IF, 6Q7G detector, 6F6G audio output, 5Y3G rectifier. 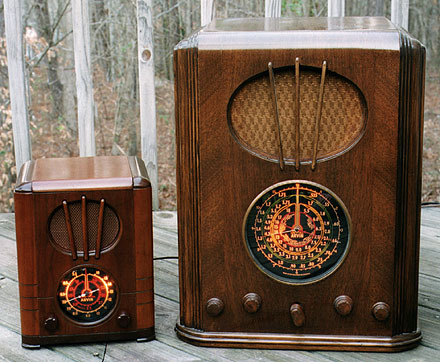 The Arvin 617's bandswitch knob (it's the one in the middle) is not original. 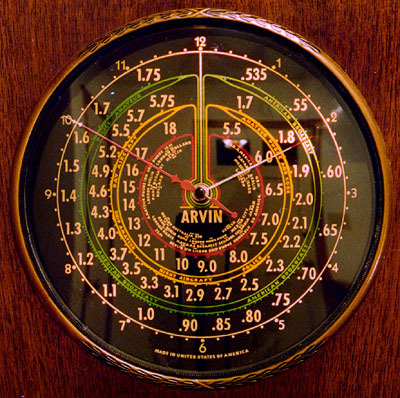 This is the model 617's dial. It has a "traveling spotlight station finder." There's a row of three pilot lights (one per band) behind the dial that travel around with the pointer to give extra illumination to the band, and the part of the dial, one is tuning.